Get more from your Myrtle Beach golf vacation! 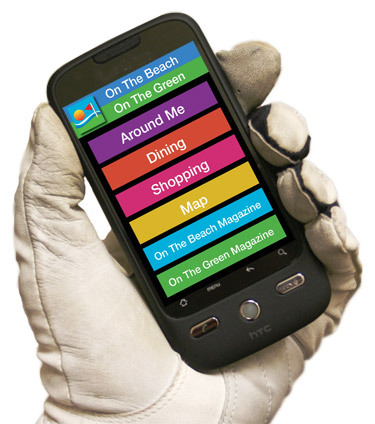 The FREE On The Beach / On The Green cell phone app is designed to make your golf vacation in Myrtle Beach, SC even better by making sure you don’t miss any of the good stuff. Restaurants, shopping, entertainment, golf and more are all in the palm of your hand. This app is brought to you by the publishers of On The Green Magazine, the Golf Magazine of the Carolinas’ Grand Strand; and On The Beach Magazine, the Tourism Magazine of Myrtle Beach. This one app covers both beach and golf vacation information. There’s a version for both Apple and Android devices. Both are FREE! Around Me – Uses GPS to show you the nearest dining, shopping, golf courses, attractions, etc. Dining – A list of all of our restaurants with description, phone, map location, coupons, etc. Golf – A list of all of our golf courses (over 100) with description, phone, map location, coupons, etc. Nightlife – A list of all of our night clubs and late night activities with description, phone, map location, coupons, etc. News – A continuously updated stream of local news from the Myrtle Beach Sun News. On The Green Magazine – All 100 pages of the magazine are in the app. On The Beach Magazine – All 100 pages of the magazine are in the app. Map – Google map with all businesses marked. Your GPS shows you where you are on the map. Radio – Local radio stations are included in our app. Listen any time. Car Finder – Let GPS mark your parking spot on our map. Find your way back to it later. Shopping – A list of all of our shopping venues with description, phone, map location, coupons, etc. Download yours today and get the most from your Myrtle Beach Golf Vacation.